If you’re planning to purchase fresh flowers and you have a Whole Foods Market near you, take note of this upcoming deal! Starting February 12th and running through February 14th, those of you in selectstates can head to your local Whole Foods Market to score 2 Dozen Whole Trade Roses for ONLY $20-$24.99 – that’s as low as $10 per dozen. Before you make a special trip, I encourage you to contact your local store to verify participation. The Whole Trade Roses program guarantees fair prices to producers, safe and healthy working conditions for farm workers, environmentally-friendly growing practices and high quality products. 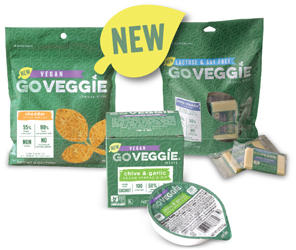 Get a FREE Go Veggie Cheese Alternative Product Coupon ($6 Value)! Please fill out the information to receive a coupon good for one free GO VEGGIE product of your choice. That’s a $6 value! **This is a printable coupon offer. Here is the direct link to the printable coupon. Plus earn $1 On the Checkout51 app if you do not already have the app you can sign up here. Making it a $1 Money maker!